Barley"s susceptibility to waterlogging on older irrigation layouts, along with the lack of suitable varieties, has long kept this valuable crop outside the irrigation sector. However, these constraints have been reduced by improved irrigation layouts and new varieties. Improved layouts and structures, laserlevelling, permanent beds and better drainage systems allow faster water application and drainage rates, resulting in less waterlogging. Newer, semi-dwarf varieties have higher yield potential and are less susceptible to lodging and head loss. Also, the earlier maturity of barley compared to other winter crops can benefit a double cropping system. In recent years, both the malt and feed markets have given good returns. New varieties with higher yield potential are being released and the colour standards for malting have been eased. Barley can be a valuable rotation with wheat, particularly in no-till and stubble retention systems, as it is not a host for most wheat foliar diseases. Its vigorous early growth allows it to compete well with weeds, requiring lower herbicide rates. It often needs fewer inputs than wheat. Few irrigated barley variety trials are conducted each year and so the following comments are based on dryland trials. Protein content is a major determinant of malting quality. High protein levels reduce malt extract. In dryland areas, keeping below the 12 per cent upper protein limit can be difficult, as the nitrogen levels needed for maximum yield result in grain protein of about 11 per cent. Any additional nitrogen rapidly increases protein and screenings. Figure 1 shows the effect of nitrogen on grain plumpness for Schooner and GairdnerA sown on two dates at Condobolin. There is a steady decrease for each variety at each sowing time. However, retention was lower for GairdnerA than Schooner, and lower for the June than the May sowing. The allowable limit for malting is 70 per cent retention. A similar response was evident at a high yielding site, Alectown, in 2004. A deep nitrogen soil test at sowing showed there was 130 kilograms of mineral nitrogen per hectare (N/ha) in the top 60 centimetres and this was sufficient for an average yield across varieties of 4.2 tonnes per hectare. Additional nitrogen fertiliser decreased yield and plump grain and increased screenings in all varieties. However, even at the highest nitrogen rate, Schooner was above the 70 per cent retention limit, whereas additional nitrogen pushed GairdnerA below the limit. Low-grain protein can also be a problem, particularly for irrigated crops, as most markets require barley above 10 per cent. Japanese malt markets prefer 11 per cent protein. 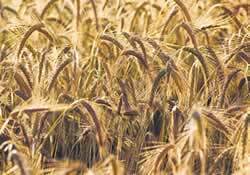 The minimum for malting grade has therefore been increased to 9.5 per cent. Nitrogen management is essential. Rules of thumb have been developed for dryland crops; for example, if more than 100kg nitrate N/ha is present at sowing, additional fertiliser nitrogen increases the risk of excessively high grain protein levels. However, higher levels of nitrate nitrogen will be required for GairdnerA under irrigation. Early indications from trials are that it is inadvisable to increase the seeding rates of irrigated barley, and GairdnerA in particular, beyond about 100kg/ha. Higher rates reduce grain plumpness, with no yield increase. For fully irrigated crops where there is minimum risk of screenings, a plant density of about 200 plants per square metre is desirable. This is about double the rate for dryland crops, where populations of 70 to 110 plants per metre squared are likely to provide a balance between yield and grain quality. For maximum yield and acceptable quality, barley should be grown on medium-fertility paddocks, with layouts able to be watered and drained in eight to 12 hours. The soil profile at sowing should be at about 70 per cent of field capacity, which may require a pre-watering, depending on the cropping sequence. A deep soil nitrogen test or early tissue tests should be used to determine the need for additional nitrogen, and this should be applied before the end of tillering. Irrigation before flowering (before ear emergence) is desirable to ensure grain set and the maintenance of green leaf area. Further irrigation during grain-filling should ensure that soil water content is maintained above 60 per cent of field capacity until the soft dough stage. Premature drydown will limit grain yield and increase screenings. With good management, target yield for a fully irrigated crop should be at least 6t/ha. If limited water is available, manage irrigation timing and reduce nitrogen inputs to maintain grain quality. Read this article in GC North; South; West issue 58 - Subscribe and recieve the hard copy of GroundCover in your mailbox for free, remember to select 'Post' as your subscription method.